If you are playing Truth or Dare game with your friend or lover and looking for some good dares over text to ask them, then you are at the right place. Today we have collected a lot of good dares to ask over text to make your game memorable. 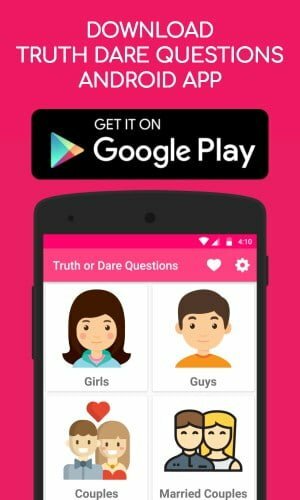 In case if you are also looking for more truth or dare questions, check them here or at Quora. Since it is not easy to monitor whether your buddy has performed the dare properly, make sure you ask them to send a proof to prove it. So without any further delay, check our collection of good dares over text messages right below. Stand upside down for 15 seconds. Drink a cup of hot tea/coffee without lifting down. Brush your teeth with coal. Sit on your hands for one minute. Apply shampoo to your dry hair and don’t rinse it for 30 minutes. Send love letter through email to your class teacher. Select one mobile number blindfolded from your contacts and send one breakup message to him/her. Mix one egg yolk with sweet sauce and eat it. Put your mouth full of ice cubes and keep them until they melt. Open your wallet and explain all the things in it briefly. Give a deep explanation of one item in front of you. Paint your fingernails blindfolded with a pencil. Touch any one of your friend’s elbow. Let someone tie your hands with a plaster. Write some text blindfolded on your Facebook timeline and post it. Pour some sauce on your toes and let it dry. Walk and dance at the corners of this room. Do a prank call to your mother and tell “I’m expecting a baby soon”. Put your handkerchief in your mouth until it completely turns wet. Wear “Kiss me…It’s my Birthday” board over your neck for 20 minutes. Do as many pushups you can. Wear all your clothing inside out for 1 hour. Drink a cup of tea/coffee like a dog. Walk backward blindfolded until you find something. Go outside and belly dance. Peel banana using your toes. Dip your t-shirt in soap water and keep it in the fridge for 20 minutes and wear it. Rub your face with chocolate cream keep it for 20 minutes without rinsing it. Take a selfie blindfolded and post it on your facebook timeline. Go and hug to the first tree you saw outside. Open your fridge and taste each and every item you find in that fridge. Sing your favorite rhyme with child voice along with actions. Imitate your class teacher’s voice and with actions. Do cartwheel by holding your mobile. Put your mobile on your toes and walk backward blindfolded for 20 seconds. Select one person here and rub their thigs. Let someone roar like a lion nearer to your ear. Sing your favorite song loudly while bathing. Imagine your enemy is in front of you, now do war with him. Squeeze lemon juice on your elbow and lick it. Stop the next person you saw on road and tell “I Love You” to him or her. Taste the ink of any pen in front of you. Clean your sink using your toothbrush. Fill your mouth completely with water and say your name. Imagine you’re a spiderman and do some simple stunts like him. Wear your opposite gender’s clothes. Go to your neighbor’s house and have a meaningless conversation with them for 10 minutes. Do manicure to your best friend. Let someone tickle you for 20 seconds. Eat two boiled eggs at a time. Watch one horror movie alone and ask someone to check your temperature. Go outside and beg a stranger for money. Select one song from Youtube and write lyrics of that song. Walking along the road with wet white clothes for 1 minute. Remove any one of your friend’s socks and smell his/her feet. Let someone draw your face on your back with lipstick. Wear your socks over your head for 10 minutes. Eat a mouthful of unboiled noodles. Imitate your friend crush’s voice. Switch off your mobile for one hour. Explain your first day of school with actions only. Wear your shoes without wearing socks. Guess everyone’s age here, if it was wrong they will tickle for 30 seconds. Take a selfie while picking your nose and post that picture on your Facebook timeline. Let someone kiss on your forehead with full of lipstick on his/her lips. Go to your nearby tree and argue with it for 20 minutes. Let someone kiss you under your chin for 30 seconds. Explain your worst bathroom experience. Ask someone to prank you. Stand on your hands and drink one glass of water. Give a body massage to someone here for few minutes. Spit as far as you can. Let someone give you a hairstyle and you have to be with that style for one day. Call your crush and flirt him/her. Put your finger on someone’s ear. Open dial pad and type one random number and do meaningless conversation with them. Give high-five to everyone you see on road for 10 minutes. Do 25 situps and not to pause between them. Place one glass with full of water and stand on a single leg for 5 minutes. Try to stand on your toes for at least 30 seconds. Do four back cartwheel in a row. Let someone shave your beard. Eat one watermelon with seeds. Imagine you’re a rat and act how you will escape from the cat. Let someone play music and you will guess that song name. if wrong they will give a small punch on your head. Let someone send one message to anyone from your contacts. Taste one drop of coconut oil. Do break dance for a slow song up to 3 minutes. Select one person in the room and dance with him/her. Select one movie name and act until your friends guess that movie name. Make every person smile here, if not keep going until everyone smile. Write any funny words on your forehead and keep it for half day. Take the dustbin from the kitchen and sell it to an unknown person. Crack two eggs on your head. Select one prank video from youtube and do exactly what they do in that video. Close your eyes, let someone kiss you and you have to guess who he/she is. Attempt to do one magic trick. Select one person of your same gender and talk with him/her for 10 minutes. Act like someone’s pet for 30 minutes. Let someone give you one object and compose a poem on that object. Select one person blindfolded and get slapped. Imitate your favorite celebrity and make everyone laugh. Eat one spoon of garlic paste. Hope you like these good dares over text and make your texting smooth and funny. If you know any other good dares over text messages, then please comment them below and let everyone know them.